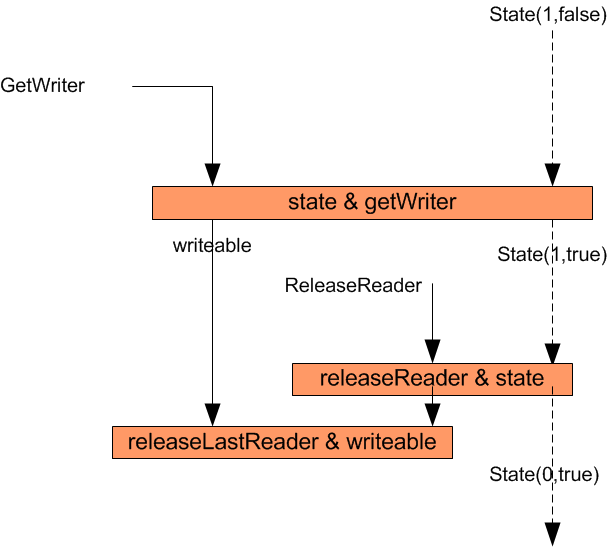 Let’s follow the state machine with a concrete example. We start in the Idle state, a reader requesting a lock takes us to the Readers(1) state. If the reader releases its lock we are back in the Idle state. Now a writer can get the writer lock, which takes us to the Writer state. Releasing the writer lock takes us back to our starting point. 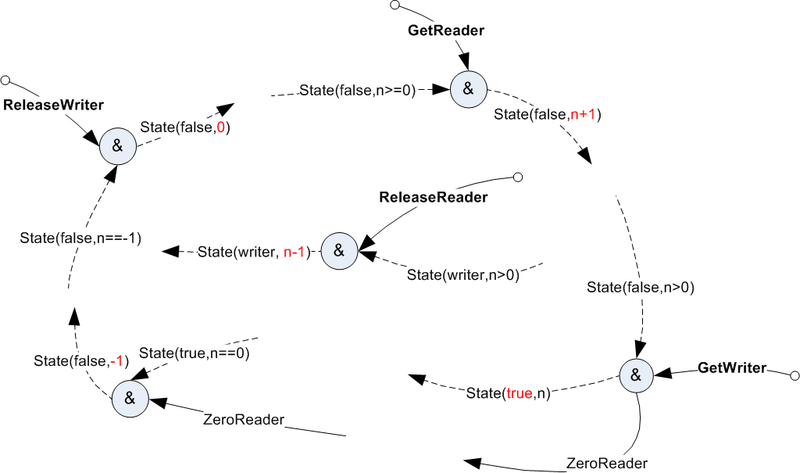 This diagram gives a very good picture of the actual state machine. The states correspond to private asynchronous methods of which only ever one can exist at a given time. The transitions are performed by the public synchronous methods. These will report forbidden transitions by throwing an exception. Note that both will preserve the state. Two words of explanations, the round boxes represent chords. Incoming arrows are incoming messages, outgoing arrows are messages called in the body of the chord. Solid lines indicate synchronous messages, while dashed lines represent asynchronous messages. 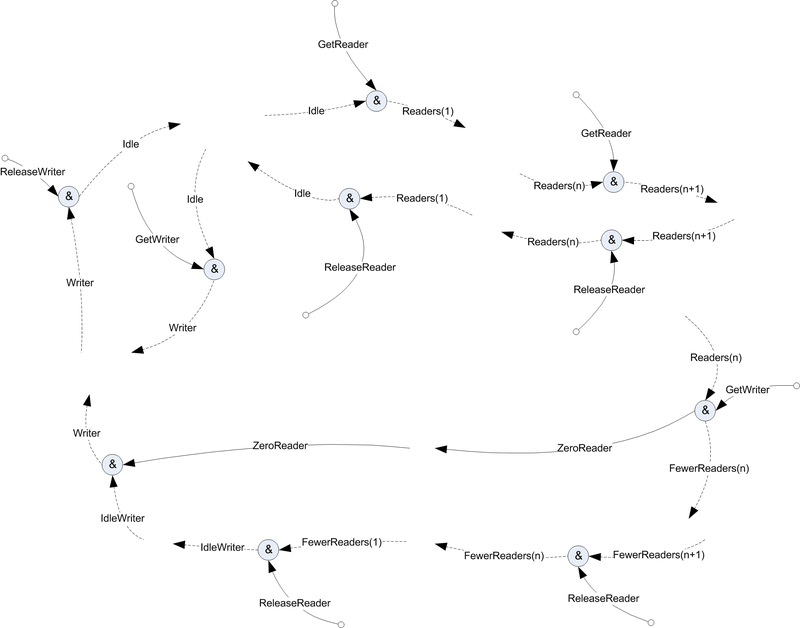 The arrows starting with an empty circle indicate messages originating from outside the join class. 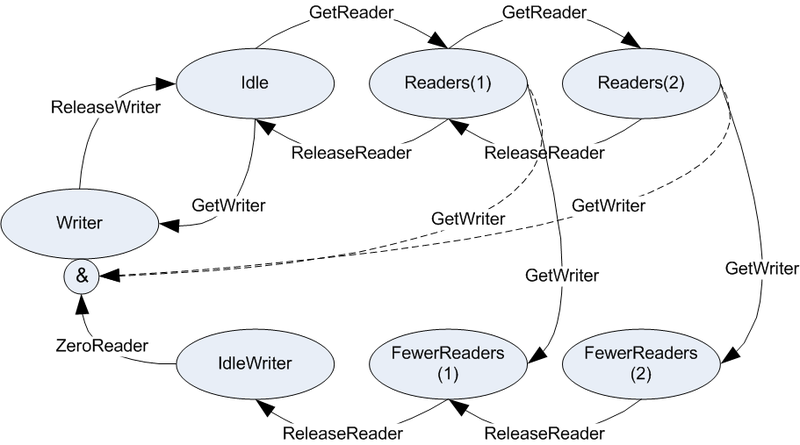 This diagram shows the blocking nature of the GetWriter message better than the previous one. But I am not sure how clear it really is, it would probably be enough to add a few more states to make it impossible to read. Most of the complexity of our diagrams stems from the proliferation of states. Would it be possible to reduce the number of states? Could we encode the actual state as message arguments as we are doing it for the number of readers? We could have something like State(bool,int), the bool would be true if a writer is waiting for the lock, false otherwise, and a positive integer value represent the number readers, while a value of -1 would indicate that the writer lock is taken. The number of chords has been reduced from ten to five. They could well be cases where the reduction could be even more significant. where the predicate applies to the whole chord. In this case the predicate would have to be evaluated against all possible combinations of queued up messages. In the first case, where the predicate is attached to the method itself, the predicate acts as a simple filter on the messages, which is much easier to implement and much more efficient at run-time. This per-method option makes it however impossible to combine arguments from different messages in the predicate.